Saudha, Society of Poetry and Indian Music is dedicated to the study of music and the renovation of techniques constantly in order to create new audience of classical and semi-classical music(mainly Indian) through gluing it up seamlessly with other serious forms of art (e.g poetry, classical dance) that can, as a whole, signify, interpret, intensify and complement the mood and the meaning of each other. The central concept is to intertwine melodious poetry or other relevant art forms ( e.g Western Classical music, Classical Dance) with mainly Indian Classical Music so that each form of art decodes, complements and interprets each other. Concert The Society aims to propagate the message of love and connect deep humanism to cross the cultural barriers through remedial and transcendental music. The experiments are designed cautiously to create new audience by introducing new way to communicate the under- represented and abstract form of music and also by revolutionizing the existing way of listening classical music. Verses from both oriental and occidental poetry are harmoniously hybridised with the tune of melodious Indian ragas or the mellifluous verses of contemporary world poets are blended with Kheyal, Thumrietc to give a set of relevant images in order to signify the mood of the music creating an ecstatic colourful ambiance. Saudha aims to experiment and research the link between musical poetry and poetic music, to hybridize profane and sacred verses and to explore the ways to harmonize the Indian classical instruments and vocal with world musical instruments and vocal music. 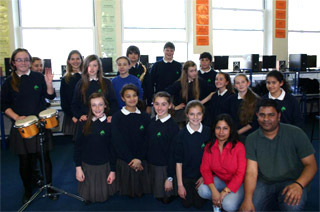 London Borough Of Sutton To promote Indian Classical Music along with world poetry and literature through workshops, seminars, training, teaching, publications and concerts involving children and adults from all communities and background. To promote and publicize the rare and undiscovered music and poetry from different corners of the world including the most known form of music e.g. 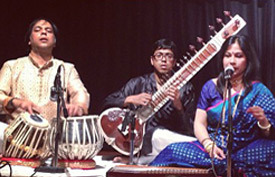 western classical as well as to link them with Indian music through a range of cautious fusion activities. To glue up Indian classical music seamlessly with relevant world classical music and other renowned art forms (e.g. Poetry, Kathak, Bharatnatyam dance) in order to target, connect and develop new diverse audience of Indian classical music. To reach and to create interests in young and socially excluded people as many ways as possible for them to discover the splendour and the treasure of transcendental music and to get them to be involved with the magic of experiments. To connect with people with mental disabilities, autistic children, lonely individuals and explore the ways to apply music as therapy for them. To encourage participation and active involvement of critics, young musicians and poets.